Heat oil in large skillet over medium-high heat. 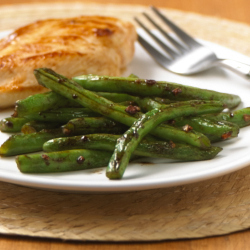 Add green beans; cook 10 to 12 minutes or until crisp-tender, stirring constantly. Add garlic during last 3 minutes of cooking. Remove from heat; stir in soy sauce and peanut butter.